Researchers at NASA have discovered in the atmosphere of Titan a substance that may indicate the presence of microorganisms on the satellite of Saturn. At an altitude of 200 kilometers above the surface of the satellite, a small concentration of acrylonitrile, a compound participating in the formation of cell membranes of microorganisms, which may live in methane oceans, is fixed. The largest number of molecules was found over the south pole. 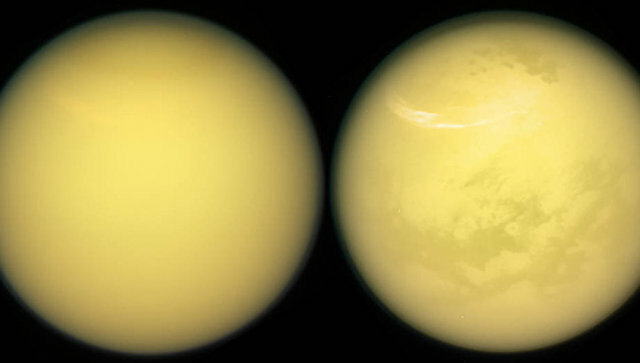 At low temperatures (minus 179 degrees Celsius), prevailing on Titan, acrylonitrile concentrates in droplets and falls into methane lakes. The experiment showed that in the northern part of the satellite the substance should be sufficient to create ten thousand living cells per cubic centimeter, which exceeds the number of bacteria in the coastal regions of the terrestrial oceans. To detect the compound, scientists used a complex of radio telescopes Atacama Large Millimeter Array.